Another week, another look into Ducky's jewel vaults! Today, we're gazing upon one of the suites of jewelry that she inherited from her mother, Grand Duchess Maria Alexandrovna of Russia, Duchess of Edinburgh (and later Duchess of Saxe-Coburg and Gotha): her imperial sapphire parure. The sapphire and diamond set was a present to Maria Alexandrovna on her wedding in 1874. Her groom was Prince Alfred, the second son of Prince Albert and Queen Victoria. The pair married at the Winter Palace in St. Petersburg, surrounded by her Romanov relatives. Along with a ruby tiara and a diamond fringe, Tsar Alexander II gave his daughter a parure of diamonds and sapphires. The set included the tiara, a necklace, and a stomacher that could be broken into two brooches. The sapphires were designed with Maria’s future role in mind. The blue gems were set in diamond elements that included floral motifs symbolizing her new home: roses (for England), thistles (for Scotland), and shamrocks (for Ireland). 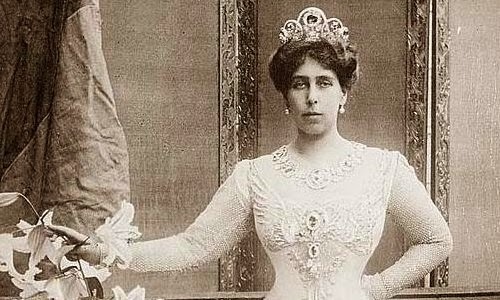 In her write-up on the jewels, Ursula states that the sapphires had an even longer royal history than the set itself; they were inherited by the tsar from his mother, Alexandra Feodorovna (who was born Princess Charlotte of Prussia). 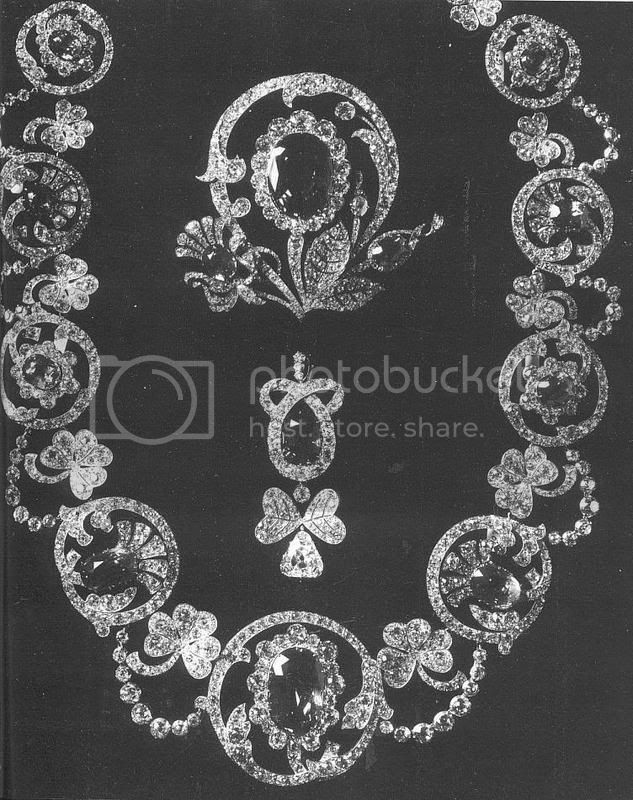 The parure was passed from Maria Alexandrovna to her second daughter, Victoria Melita. As we've discussed before, Ducky was unlucky in love; her first marriage to Ernst of Hesse was a bust, and her second wedding, to her cousin, Grand Duke Kirill Vladimirovich, was controversial. But she managed to hold on to the sapphires through both weddings. She was photographed in the complete parure in 1909, after she became Grand Duchess Victoria Feodorovna of Russia, but before she and the rest of the surviving Romanovs were forced to flee the country. In her biographical sketch of Ducky, Meriel Buchanan  describes the grand duchess wearing the sapphires during the Blessing of the Waters of the Neva ceremony in 1911: "the Grand Duchess Cyril looked magnificent, her train of cornflower-blue velvet lined with silver, a tiara of sapphires and diamonds blazing on her head, her blue eyes alight with happiness" . Sadly, like so many jewels with Romanov connections, the whereabouts of this sapphire sparkler today are unknown. We know what happened to the necklace and the stomacher; Ducky sold them to Cartier in Paris after the Russian Revolution. (The sale probably happened around the same time she sold her Greek key kokoshnik to the Romanian royal family.) As for the tiara, who knows? I have a feeling it most likely met the same fate as Ducky’s other jewels. Times were tough for deposed royals, and nearly all of the surviving Romanovs sold off their gems to finance their post-imperial lives. I think it’s a safe bet that this piece was sold and likely broken up, joining so many other Russian tiaras in the mists of history . 1. Cropped version of an image in the public domain; source here. 3. Muriel was the daughter of Sir George Buchanan, the British ambassador to Russia. 4. You can read the full biography here. 5. A version of this post originally appeared at A Tiara a Day in November 2013.